My option activity has picked up over the last few weeks and luckily it's been a profitable couple weeks. I mentioned in Monday's option recap that last week was extremely busy with over 30 different opening/closing/rolling moves to report. As such I split my weekly options recap post in two. If you're interested in the new or rolled positions check out this post. Today I'm going to cover the various closing trades and earnings plays that I made the week of May 1-5. 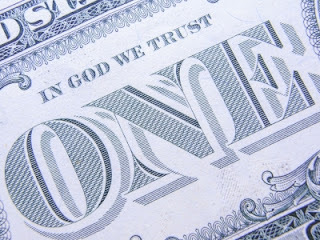 One of the things that makes options wonderful is that you can reduce your cost basis if they are used properly. When you own shares your cost basis is what it is; however, when you sell options against those shares every time an option expires OTM or you close the position for a profit you're effectively reducing your cost basis. For example, I purchased shares of VF Corporation back in January for $53.50 per share. 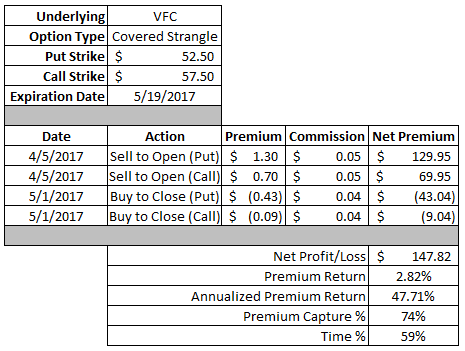 Since then I've been using options, primarily covered strangles, to reduce my cost basis. After closing out this covered strangle, as well as the ones prior, my cost basis is down to $49.25 per share. Not bad at all! This position produced net profits of $147.82. Based on the $5,250 of capital securing the put portion of the covered strangle that's a solid 2.82% return. Since the position was open for nearly a month that's equivalent to a 47% annualized return. I was able to capture 74% of the maximum profit potential in 59% of the days until expiration. This trade worked out about as well as I could have hoped for since it wasn't set up in the most ideal conditions and it's not like I'm going to complain about turning a profit even if it was a bit smaller than I'd have liked. This trade generated net profits of $31.85 which might not seem like much however the capital at risk was only $159.57. So that's actually a solid 20% return on capital in just a few weeks time. 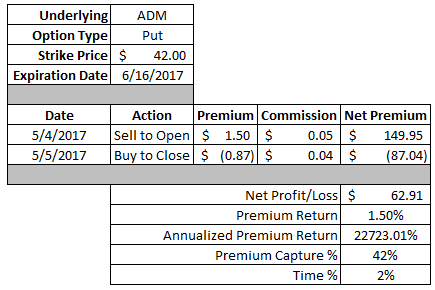 I was able to capture 23% of the maximum profit in 42% of the days until expiration. In the end this trade worked out and turned a profit; however, I let impatience get the best of me. I should have waited longer to close out the position, but seeing red across your portfolio (several option positions in gold and gold related products) made me want to lock in some profits wherever I could. Although since this was closer to a synthetic strangle than an iron condor I was happy to take my profits and run. Overall this position produced net profits of...drum roll.....$4.84! That's nothing to brag about, but it is what it is. Since there was $355.58 in capital at risk on this trade that's a lousy 1% return on capital. I was able to capture 11% of the maximum profit in 40% of the days until expiration. That post French run off election move in the markets really hurt this position and sucked out a lot of the profit potential unless I wanted to wait right up until expiration which would introduce a whole other set of risks. Earnings season is a great time for options investors because there's heightened implied volatility which means heightened option prices. In turn there's opportunities to make quick profits in just a day or two's time. That works out especially well though for options traders that double as dividend growth investors because I'd have been just fine owning more shares of CVS should this trade have worked out differently. This earnings play covered strangle generated net profits of $120.82. Based on the $8,000 of capital securing the put side of the strangle that's a solid 1.51% return in just 1 day. I was able to capture 89% of the maximum profit potential in just 25% of the days until expiration thanks to the post earnings volatility crush. 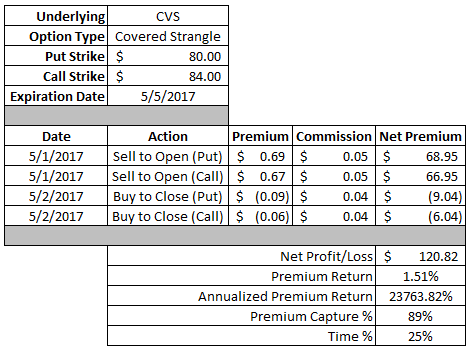 CVS is another good example of how I've been able to use options to reduce my cost basis. In January I purchased shares at $83.20 per share and over the last 4 months I've used options to effectively reduce my basis down to $77.31. That's a 7% reduction in just a few months' time. MasterCard, along with Visa, is a company that I want to build up a sizable position in. However, I only want to do so at prices...err...valuations...much lower than they are currently at. On the heels of MasterCard's price increase over the last few weeks and earnings on deck I figured a neutral play was the best which mean an iron condor. This iron condor earnings play generated net profits of $25.84 with $156.58 in capital at risk. That's a solid 17% return on capital in just 1 days time. I was able to capture 60% of the maximum profit potential in 25% of the days until expiration. Thank you post earnings volatility contraction. 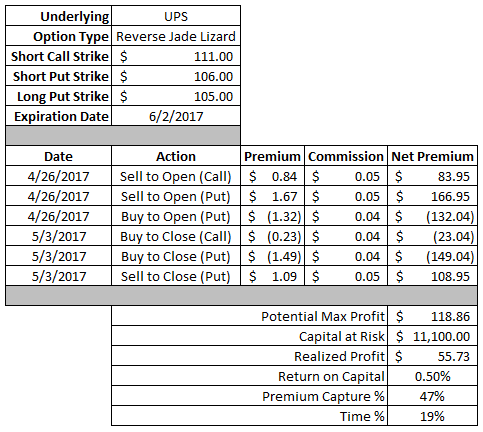 Covered call's are one of the simplest strategies when it comes to options. Essentially you cap your upside potential by agreeing to sell your shares at a certain price point and receive the option premium for doing so. Over the long run it's a winning strategy since most of the time the market tends to grind higher rather than jump higher. This covered call produced net profits of $25.91. Based on the $34 strike price that's a 0.76% return. The equivalent annualized return is a hefty 41%, although this was partially juiced up due to earnings and isn't a realistic expectation of the returns going forward. I was able to capture 89% of the maximum profit potential in 44% of the days until expiration. A what? Option strategies get some funky names. 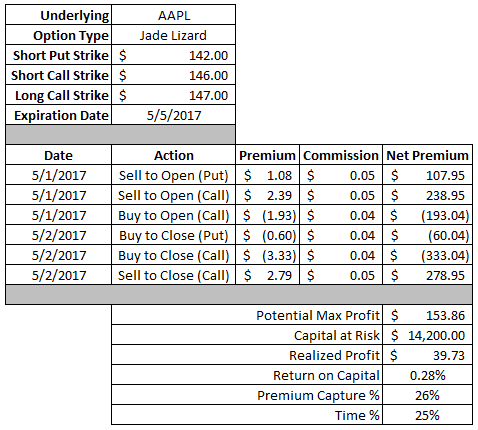 The jade lizard is created by selling an OTM put and selling an OTM call spread. Essentially you want the underlying's share price to be between the strike price of the short put and the short call to maximize your profit. The reason I like the jade lizard is that you collect more credit than just selling the put option and if done right you collect more premium than the width of the call spread so you take no risk to the upside. I originally opened this position as my earnings play on Apple, but neglected to double check what date and time earnings would be released. So I was a bit early on this one and Apple's share price took off higher before earnings were released. So I closed this position out early for a profit and opened a different earnings play which I'll highlight later. I was able to lock in profits of $39.73 on this jade lizard. It wasn't ideal, but Apple's share price shooting higher pre-earnings kind of messed things up for this position. With $14,200 in capital securing the put that's just a 0.28% return on capital. I was able to secure 26% of the maximum profit potential in 25% of the days until expiration. A reverse jade lizard? Okay, I've lost it for sure. The reverse jade lizard is the same thing as the jade lizard, except it's reversed! With the RJL you sell an OTM call option and an OTM put spread. Keep in mind that I currently own 100 shares of UPS in my Rollover IRA that I acquired via put option back in February. 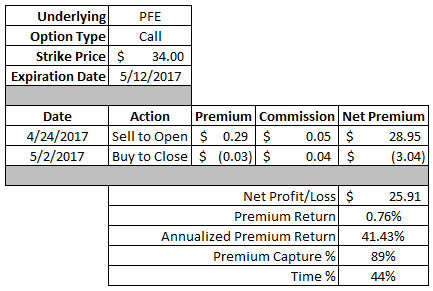 So I did this in place of selling just a covered call in order to collect just a little bit more premium. This reverse jade lizard generated net profits of $55.73. Based on the $111 strike of the call option that's a decent 0.50% return on capital. 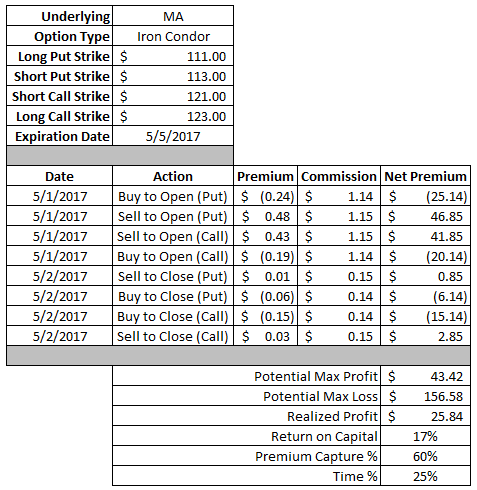 I was able to capture 47% of the maximum profit potential in 19% of the days until expiration. This was originally an earnings play gone slightly bad that I had to roll out in time in order to extend the duration. I closed this position out earlier that I normally would have though for two reasons: (1) I still had another put option open on Starbucks and didn't want to take the risk of having a 200 share position and (2) I needed to free up some capital for other potential option plays. I was still able to lock in a decent profit of $38.82 in a relatively short time frame. Based on the $6,050 of capital securing the contract that's a decent 0.64% return. The annualized return on this is pretty large at 47.6% although that's not really indicative of what you can expect over any longer time frame. I was able to capture 31% of the maximum profit in 27% of the days until expiration. Gilead Sciences has been in a rut over the last year or so and the share price has continued to drift lower. This is primarily because they lost the patent on one of their major revenue sources and despite having a huge stash of cash management hasn't found any company they want to purchase to improve their pipeline. Frankly I think that's a prudent choice given the current market environment because you don't want to pay a premium to buy a company that is already trading at a premium valuation. Better days lie ahead for Gilead Sciences. Since I didn't expect any news to come out about a potential purchase from Gilead which is about the only thing that would really move the needle that meant a neutral option trade. This iron condor earnings play generated net profits of $13.84. That might not seem like much, but you have to keep in mind that there was only $72.58 in capital at risk on this trade. So that's actually a solid 19% return on capital. I was able to capture 50% of the maximum profit potential in 33% of the days until expiration. This was another goof up by me, but everything worked out so I can't really complain. I didn't remember when Facebook was releasing earnings, I though it was the same day as Apple, but turns out it wasn't. So I put this trade on a bit earlier than I should have. Luckily for me though Facebook moved just slightly lower after releasing earnings which allowed me to close out this position at a really solid gain. Overall this was an excellent earnings play for me that generated $131.71 in net profits. With $14,800 in capital securing the put side of the jade lizard that's 0.89% return on capital. I was able to lock in 62% of the maximum profit potential in just 25% of the days until expiration. Archer Daniels Midland's share price sold off after releasing earnings that were otherwise fairly strong. That's just fine with me though because it meant there was a possibility to use options to get an even better purchase price or as it turned out lock in a solid profit that I just couldn't really pass up. This put option generated a net profit of $62.91 in just 1 days' time. With $4,200 of capital securing the contract that's a 1.50% return. Since that was earned in just 1 day that's a ridiculous 22,723% annualized return. Yeah, that's not sustainable. I was able to lock in 42% of the potential profits in 2% of the days until expiration. Since I closed my other earnings play on Apple prior to earnings because the stock moved away from me, I wanted to make sure I got something else on. I've been looking at put ratio spreads for a while to see the mechanics of them and how they work and they're an interesting play. It's similar to just selling a regular old put option so you have no risk to the upside, but you have a sweet spot where your profit really jumps. It's just a different way to play things with essentially the same amount of risk as just a standard put option. 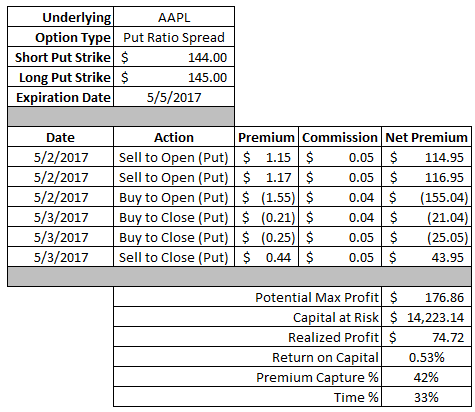 I was able to realize a profit of $74.72 on this put ratio spread. Since I would have potentially had to purchase 100 shares of Apple at $142.23 the capital at risk was $14,223.14 so that works out to a return on capital of 0.53%. Instead of easing into the water I like to go in full bore. I figured the worst case scenario was that I'd be buying shares of Facebook and then I'd just sell aggressive call against them until the shares were called away. This trade wasn't nearly as profitable as the Apple one, but it was a profit nonetheless so I can't complain. This trade had realized profits of $14.72. 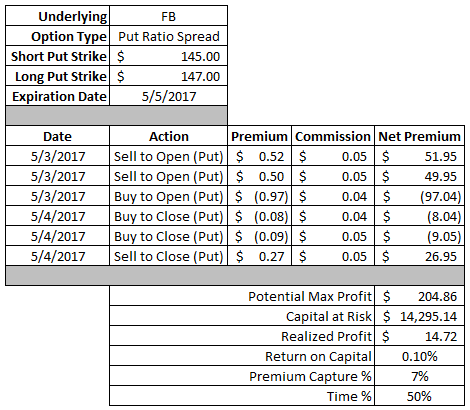 I was at risk of buying 100 shares of Facebook at $142.95 so the return on capital was just 0.10%. Coming off of April's record month I expected things to slow down a bit, but the momentum is carrying on thus far through the first week of May. 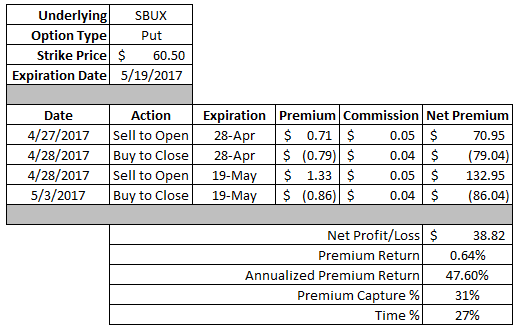 So far in May I've generated profits of $789.31 via closed/expired options. Year to date my realized profits are $6,927.85. I love your trade descriptions. Great options income. I hope to be at the same level as you one day generating this kind of income from options. Now I only have dividend income. Keep up the great work. I will continue reading your trades. 23,000%+ annualized return! My mind goes TILT trying to apply the 'rule of 70' to that. Buffet and Lynch can eat their hearts out. They NEVER posted returns like that!